Mumbai: Even as five state-owned banks reported an increase in profits, signalling a good quarter for public sector lenders, some bank stocks declined on anticipation of a likely hike in the cash reserve ratio by the Reserve Bank of India (RBI) in its second quarter policy review on Tuesday. Union Bank of India Ltd, Canara Bank Ltd, Oriental Bank of Commerce Ltd, IDBI Bank Ltd, and Dena Bank Ltd reported better-than-expected profits for the quarter ended 30 September, aided largely by non-interest income. All five banks maintained or improved asset quality as well. The stocks of the five banks failed to respond as uniformly, Union Bank of India, Dena Bank and Canara Bank’s shares falling 6.78%, 8.94% and 4.07%, respectively. Oriental Bank of Commerce and IDBI Bank rose 3.28% and 1.31%, respectively, on Monday on the Bombay Stock Exchange. Analysts said banking stocks were not driven by fundamentals but worries of an impending increase in the cash reserve ratio (CRR), or the proportion of deposits banks are required to maintain with the central bank. A hike would hurt banks’ profitability and liquidity as banks don’t earn any interest on funds parked with RBI. “The stocks were mainly driven by this fear of a possible CRR hike," said Jaiprakash Toshniwal, an analyst with domestic brokerage firm ULJK Securities Ltd. “Besides that, it was plain profit booking by the investors." Mumbai-based Union Bank of India’s profit grew 39.5% to Rs505 crore, helped along by lower provisioning requirements on standard assets, or assets that are serviced at regular intervals, and a 95% jump in non-interest income to Rs555 crore. 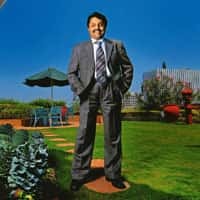 The bank’s healthiest growth was in its treasury portfolio, with profits on sale of investments jumping to Rs218 crore from a loss of Rs36 crore in the corresponding period last fiscal. Total income rose 20.78% to Rs3,761 crore, while provisions dropped 9.76% to Rs305 crore. In a sign of good risk management, gross bad debts continued to be 1.93% of total loans, compared with the year-ago period. Chairman and managing director M.V. Nair said the lender’s gross non-performing asset (NPA) ratio could deteriorate in the coming quarters to 2% of total loans because of signs of stress on restructured loans. Union Bank’s net interest margin (NIM), or the difference between a bank’s yields on loans and cost of funds, improved marginally to 2.34% from 2.28%. Nair said this could improve to 2.60% in the next quarter and to 2.80% by the end of the fiscal year in March 2010. Union Bank reduced its credit growth estimate to 18-19% from 25% earlier. However, Nair said that credit growth is picking up in infrastructure projects, particularly power projects. Bangalore-based Canara Bank’s profit rose 72% to Rs910.52 crore, also due to non-interest income which grew 163% to Rs893 crore. IDBI Bank Ltd, another Mumbai-based lender, registered a 56% rise in its net profit to Rs254 crore. The bank’s fee-based income rose 99% over the year-ago quarter to Rs390 crore. Total income for IDBI Bank rose 42% to Rs4,283 crore. The bank’s NIM, while lower than most of its peers, improved to 1.07% from 0.41% a year ago. The bank also increased its provisions to Rs383 crore in the quarter from Rs122 crore a year ago to cushion against a decline in the value of its investments and to provide for employee costs. The bank has syndicated a loan arrangement of $250 million for its capital needs, and will sign the agreement on Tuesday, said chief financial officer R.K. Bansal. Delhi-based Oriental Bank of Commerce reported a 14% rise in its quarterly profit, helped by lower cost of deposits and robust loan growth. In the September quarter, the bank’s net profit rose to Rs271 crore from Rs237 crore in the year-ago quarter, while total income grew 18.6% to Rs2,801 crore. The bank’s chairman and managing director T.Y. Prabhu said the bank had applied to the government for capital infusion of Rs1,000 crore to aid growth in the next few years, the details of which would be finalised by December. Mumbai-based Dena Bank’s net profit rose 21.20% to Rs124.64 crore with total income rising to Rs1,088.03 crore in the second quarter, compared with Rs913.84 crore in the year ago period. Non-interest income increased 47.02% to Rs125.28 crore.